Crochet is all the rage and even Cate Blanchett is wearing it. 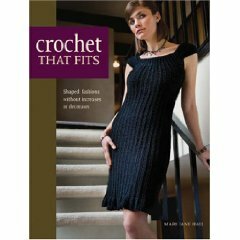 For great crochet ideas check out our new book, Crochet That Fits, by Mary Jan Hall. In this exciting new book, Mary Jan Hall introduces a graduated stitch system that utilizes crochet stitches of different heights. Using this approach, she has created a variety of crochet patterns that are easy to follow but highly unique and extremely flattering. So why not follow in Cate Blanchett’s footsteps and create a stunning masterpiece of your own. This entry was posted on Monday, September 28th, 2009 at 1:37 pm	and is filed under Uncategorized. You can follow any responses to this entry through the RSS 2.0 feed. Both comments and pings are currently closed.